Power sanders are great tools to help with the removal of old peeling paint. The amount of effort spent sanding depends on the sander used. Your efforts can be wasted using the wrong tool. 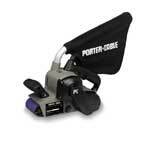 Each type of sander has very specific uses. There is no such thing as a do it all tool. If you can only afford one sander a belt sander is a good compromise. 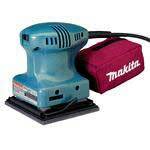 My primary sanding machine is a Makita GV5000 disc sander. Weighing in at just 2-1/2 pounds, this sander can be used for extended periods and at odd angles, works great for fascia boards, flat trim and wood siding. 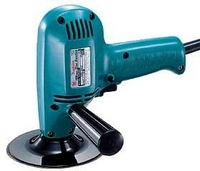 Be careful, this is a very powerful sander. If the sanding disk is to course or you stay in one place to long this sander could do some damage. I recommend practicing before using this disc sander on your home. Try sanding an old painted picket fence or a piece of trim that should be replaced anyway. Remember to use a light touch and keep it moving for the best results. Next choice is a random orbital sander. Not only does this power sander vibrate, but it also spins. This will be a very nice addition to everyone’s tool collection. An excellent choice for feathering the edges of peeled paint prior to priming. Perfect for flat surfaces, an orbital sander will provide noticeably smoother results than the disc sander. Best used for finish sanding on flat surfaces. Can be used in any direction on wood. Palm sanders are versatile and convenient and can be used on odd shaped trim. These sanders are easy to use. Plus, there is little danger of damaging the surface. Palm sanders are slower than the other types of power sanders. Because of this, there is only a small chance of doing unsightly damage. Not the best choice for stripping paints, but a very good choice for soft woods and finish sanding before stain. Always use in the direction of the wood grain. Belt sanders have their uses when preparing your home for painting. Best used on large flat surfaces before a final sanding with smooth paper. These sanding machines can go through a lot of wood very quickly, so be careful. A good place to use this type of sander is a deck floor or handrail. When choosing a power sander check the grip and test how it feels in your hand. It must be comfortable to use or you won’t use it. The better manufactures have put a lot of research and effort into reducing fatigue from the use of these tools. By their very nature sanders produce a lot of vibrations. Cheaper brands will transfer these vibrations to the users hands and arms. This will cause fatigue and could cause injury after long-term use. The brands of tools I use are well known, with parts and accessories readily available. This includes Dewalt, Makita and Porter Cable. A quality power sander will last a lifetime and perform better than a cheaper model. This is good for your wallet and the environment, no need to purchase a new sander any time soon and you won’t be throwing away all the cheap sanders.